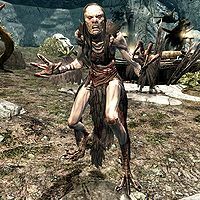 Drascua is a hagraven and the leader of the Forsworn at Dead Crone Rock. She is one of the Keepers of the Razor and as such she bears the pommel stone of Mehrunes' Razor. She will sometimes cry out, "You won't take my eye, man-thing!" This page was last modified on 15 March 2013, at 11:30.